Khao Sok Lake Modern floating Bungalows are the middle path to comfort in Nature and feature elevated beds and usually a fan. The National Park Authority recently mandated that all new bungalows must be of this quality or above. 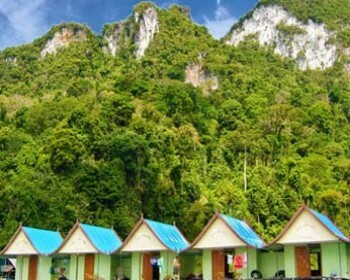 Usually made out of concrete or synthetic wood, Khao Sok Lake Modern Floating Bungalows usually feature metal guard rails and a more even and modern walkway. Some have shared bathrooms and some have in-room bathrooms. These bungalows have a slightly higher price point, but are worth it if you like a a more modern accommodation. Pern Plai Raft House is easily accessible and offers both rustic and modern style bungalows, making it a great place for large groups or families. Smiley Floating Bungalows are situated at the entrance to Klong Pey and are locally owned and operated by one of Khao Sok's oldest families. The friendly staff here are accustomed to foreign travelers making it a favorite for back packers. A local favorite, the Putowan Raft House boasts newly upgraded facilities and offers both standard and deluxe rooms. With easy access to both Diamond and Nam Taloo caves, it's perfect for family vacations and romantic getaways alike.